What Is Instantaneous Relay ? An instantaneous relay is one in which there is no time delay provided intentionally. More specifically ideally there is no time required to operate the relay. Although there is some time delay which can not be avoided. Instantaneous relay. An instantaneous relay is one in which no intentional time delay is provided. In this case, the relay contacts are closed immediately after current in the relay coil exceeds the minimum calibrated value. Figure shows an instantaneous solenoid type of relay. Although there Will be a short time interval between the instant of pickup and the closing of relay contacts, no intentional time delay has been added. e.g. one-cycle would be If 50 second in a 50-cycle system. 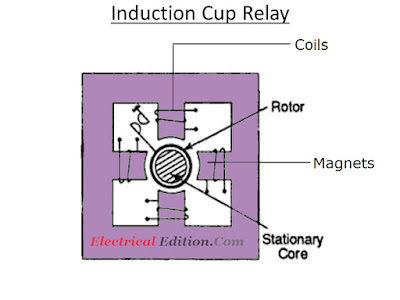 Induction Cup Relay is also a type of induction disc relays.The basic principle on which induction cup relay works is same as that of induction motor. In construction also it is identical to induction motor. 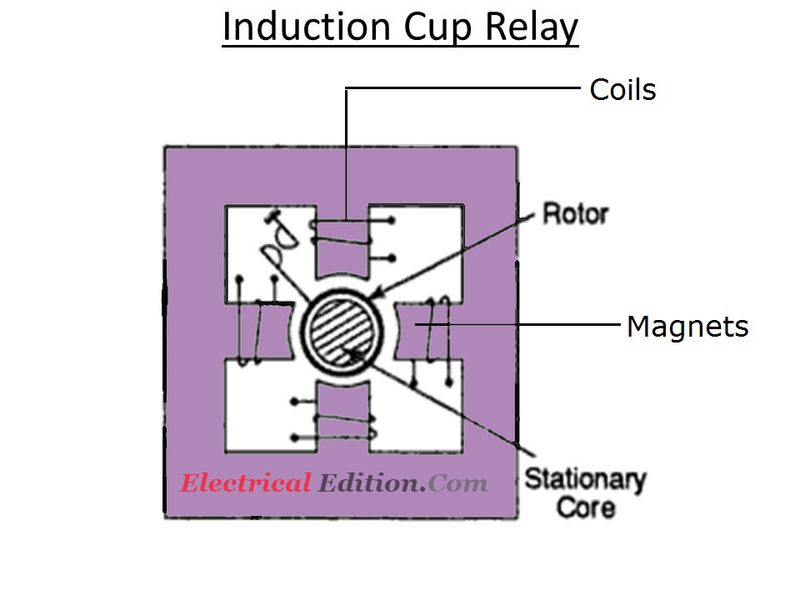 Structure of induction cup relay is Shown in figure. 1.Stationary iron core acts as stator which consists of two, four, or more poles. Now-a-days it is constructed for 4 or more poles. 2.Hollow cylindrical cup acts as rotor similar to a disc in other two relays. It is free to rotate in air gap between electromagnet and stationary iron core. 4.Induction cup relay consist of two pairs of coil, when these coils are energized, flux is produced in the coils. These fluxes will have same frequency but will have phase delay (0 to ∞ ). These coils will then energize iron core thus producing a rotating flux in the air gap. Due to these fluxes, eddy currents are made to circulate in rotor. Thus it will give rise to a force which acts on rotor. So, the hollow cup, rotates. in the direction of magnetic field between magnets and stationary iron core. There is a control spring and back stop attached to spindle of cup to avoid rotation of rotor continuously. 1. In induction cup relays the inertia of cup is much lesser than that of disc in induction disc relays. 2. Induction cup structures have very high torque to weight ratio and are therefore very sensitive . 3. They are very fast in operation due to light rotor (the operating time is less than 0.10 seconds) and are therefore suitable for high speed operation. 4. The leakage in magnetic circuit is minimum in induction cup relays due to more efficient magnetic systems. This also reduces the resistance to the induced current path in rotor. 5. Because of efficient magnetic system and light weighted rotor Volt-Ampere (VA) burden is greatly reduced in induction cup relays. The torque per VA is about three times that of induction disc relays. 6. 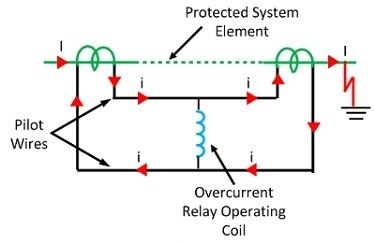 Induction cup relays can be made to have linear characteristics by proper design. They can be made to operate accurately over a wide range with high ratio of reset to pick—up value. 7. They produce a steady non—vibrating torques. 8. The parasitic torque due to current or voltage alone is small in induction cup relay. 9. They are inherently less sensitive to D.C transients. 10. Induction cup relays are best suited for protection where the normal and abnormal conditions differ marginally. Most of the relays used in the power system operate by virtue of the current and/or voltage supplied by current and voltage transformers connected in various combinations to the system element that is to be protected. Fig.1 shows the schematic arrangement of an attracted armature type relay. It consists of a laminated electromagnet M carrying a coil C and a pivoted laminated armature. The armature is balanced by a counterweight and carries a pair of spring contact fingers at its free end. Under normal operating conditions, the current through the relay coil C is such that counterweight holds the armature in the position shown. However, when a short-circuit occurs, the current through the relay coil increases sufficiently and the relay armature is attracted upwards. The contacts on the relay armature bridge a pair of stationary contacts attached to the relay frame. 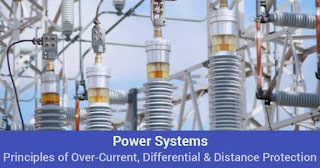 This completes the trip circuit which results in the opening of the circuit breaker and, therefore, in the disconnection of the faulty circuit. The minimum current at which the relay armature is attracted to close the trip circuit is called pickup current. It is a usual practice to provide a number of tappings on the relay coil so that the number of turns in use and hence the setting value at which the relay operates can be varied. Fig. 2 shows the schematic arrangement of a solenoid type relay. It consists of a solenoid and movable iron plunger arranged as shown. Under normal operating conditions,the current through the relay coil C is such that it holds the plunger by gravity or spring in the position shown. However, on the occurrence of a fault, the current through the relay coil becomes more than the pickup value, causing the plunger to be attracted to the solenoid. The upward movement of the plunger closes the trip circuit, thus opening the circuit breaker and disconnecting the faulty circuit. 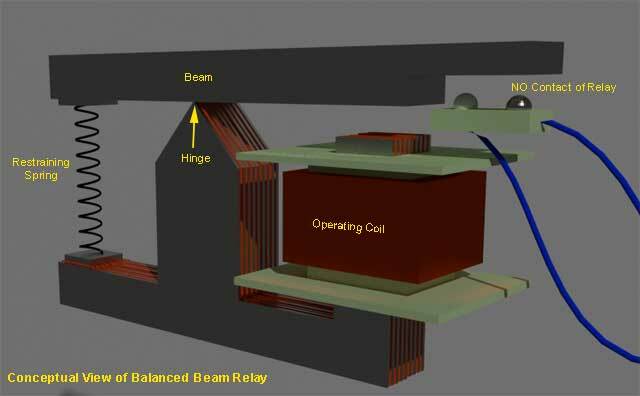 Fig.3 shows the schematic arrangement of a balanced beam type relay. It consists of an iron armature fastened to a balance beam. Under normal operating conditions, the current through the relay coil is such that the beam is held in the horizontal position by the spring. 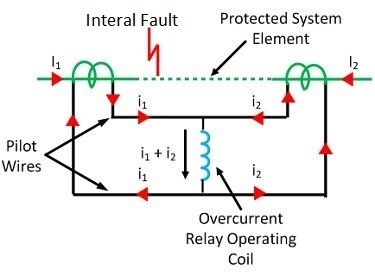 However, when a fault occurs, the current through the relay coil becomes greater than the pickup value and the beam is attracted to close the trip circuit. This causes the opening of the circuit breaker to isolate the faulty circuit.